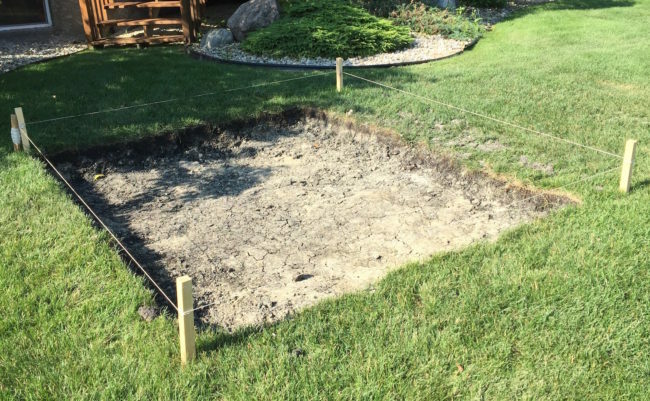 So, we love our Karubecue KBQ C-60 Pit and also like having a not-burned-down wooden deck. 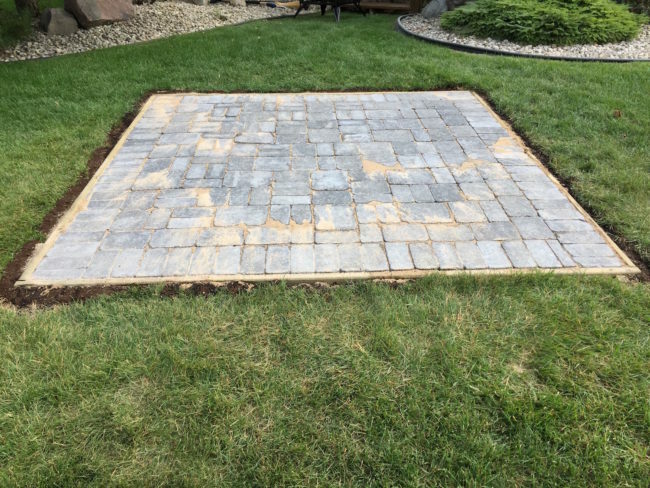 This summer, in anticipation of KBQ smoker goodness, we had a stone platform constructed where we can safely use this wood-burning wonder for hours and hours. And, it looks great – don’t ya think? Inaugural rib fest. Totally. Worth. It. Funny how the most durable, least fragile things are packed so well (! )…not that we’re complaining. Everything arrived in super shape. Two of us made lifting some of the heavier items out of the box a tad more convenient. You’ll be immediately struck by the high-quality cast aluminum capsule. A work of smoker art — and hard to imagine ever having to replace it. 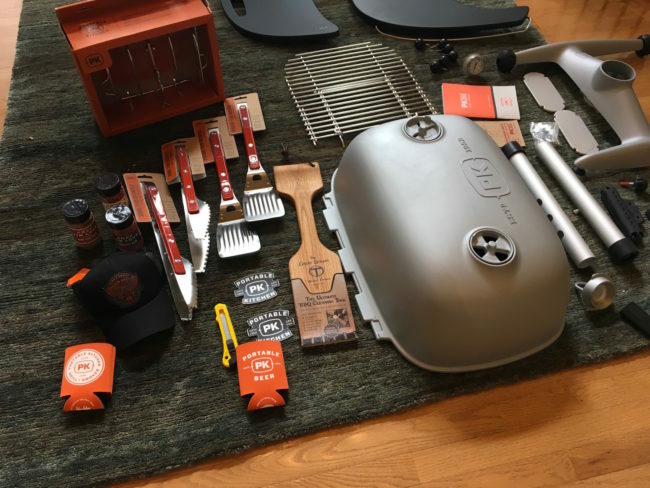 We went a little grill-happy and added some accessories, like the rib rack (in the orange box), the high-quality cooking utensils (they come with convenient hooks for attaching to the shelves when not in use). 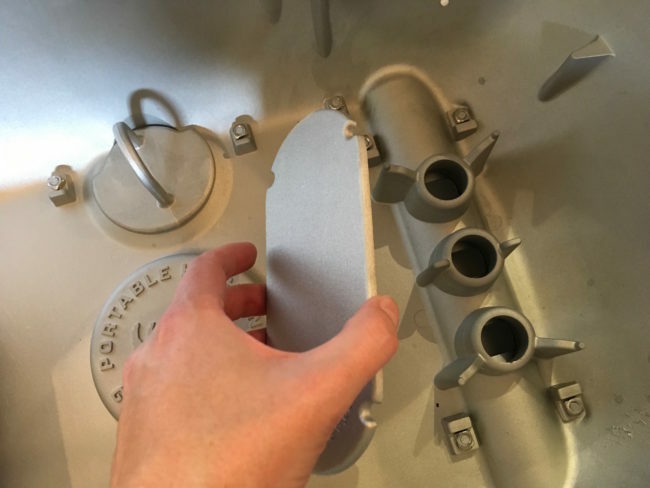 We’re especially excited about the The Great Scrape Woody Paddle (pictured to the left of the capsule) which we’ll use for cleaning the grates. It’s just a flat panel now but it will ‘groove’ as we scrape the grate clean, conforming to the exact size of the wire racks over time (for cleaning those nasty nooks and charred cling-ons). Assembled and Ready to Grill! A beauty…almost there! BTW, above you’ve got a good shot of the 4-point venting system ‘controls’. 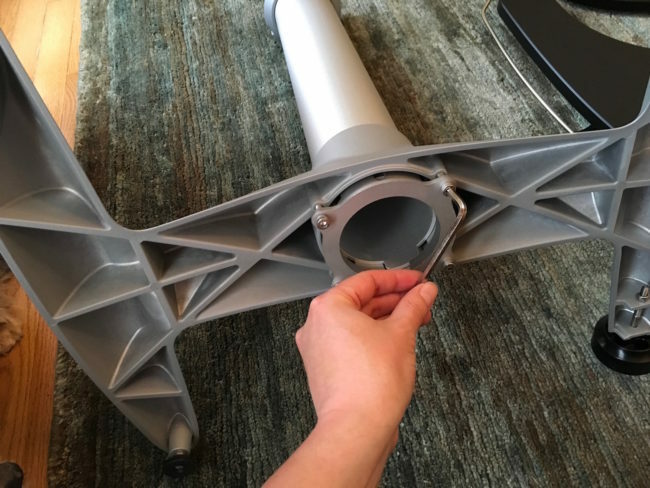 Note the circular vents on the top of the lid (that’s one and two); you control vents found inside the bottom of the capsule with the two round black dials under the unit (that’s three and four). The hinged grid is ‘grate’ (groan.) Seriously, you can easily lift it with tongs while cooking when you need to make adjustments to the coals without doing contortions over fire. And it stays propped up on its own (as you see pictured) so it won’t flop onto your meat. 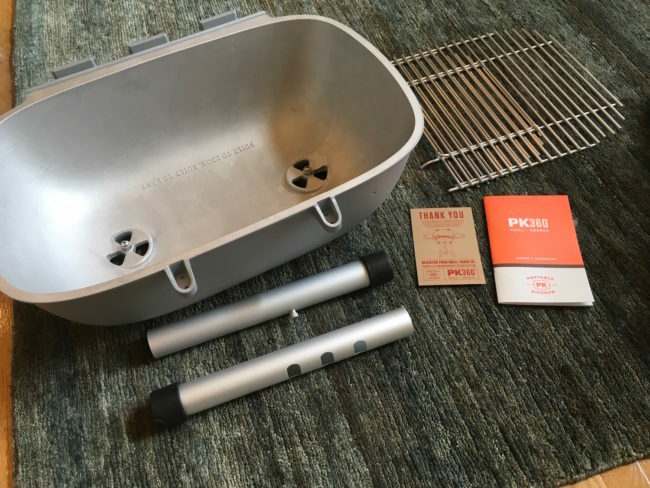 Check out this great features overview demo video at pkgrills.com showing off the 4-point vent system. As notes, your vents are protected from the ash during cooking. 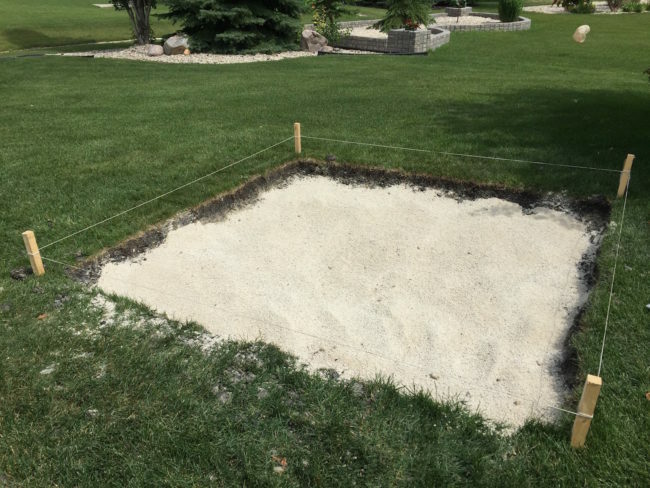 This ‘plug’ is where you can push all the ash and dump it into a bucket or bin when you want to clean up. Super easy. 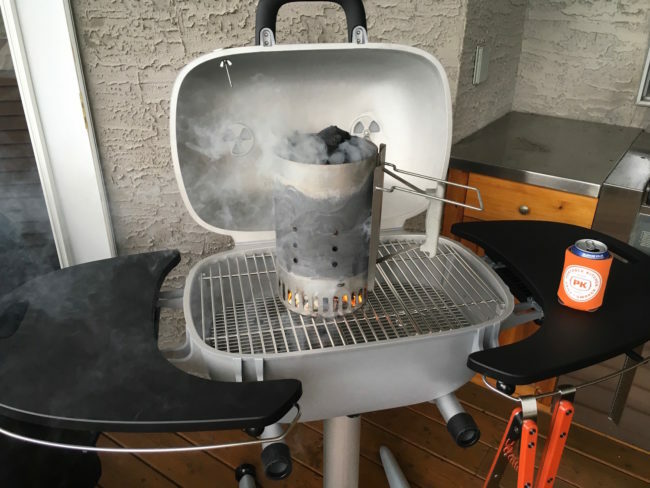 We lit things up for our first PK360 meal (rib-eye steaks) with our Weber Rapidfire Chimney Starter. 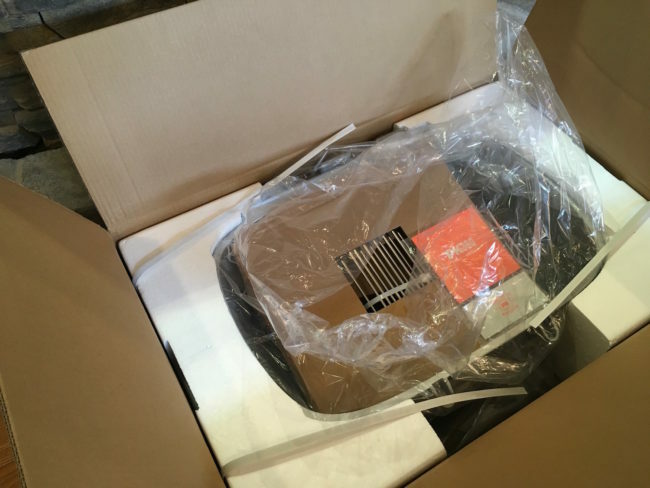 Watch for more on the PK360 – amazing griller/smoker so far. Want to buy one now? 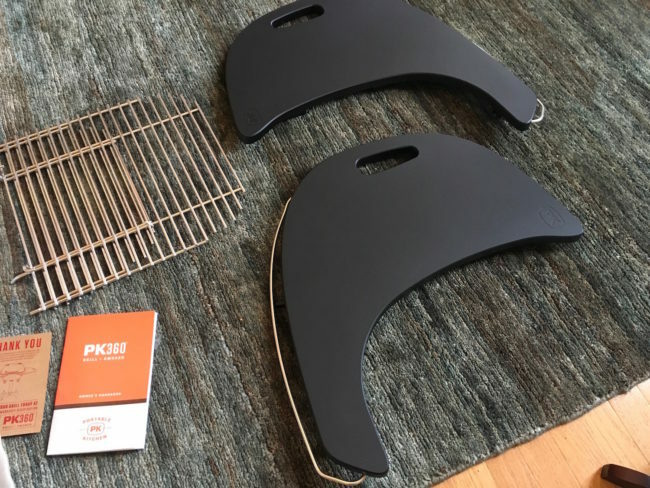 Go right to the PK360 page on the official PKGrill site. Or visit www.pkgrills.com for detailed information. Choosing Direct vs. Indirect heat is critical. As a rule, I like to use the Indirect Method when doing foods that require more than 20-25 minutes of grilling time. Whole chickens, turkeys, beef roasts, pork roasts and ribs are simply better when done this way. Direct Heat is best used for foods with total grill times of 20-25 minutes or less, and produces those classic grill or char marks that grillers love. Steaks, chicken breast, sausages, brauts and grilled vegetables are usually done this way. For a more detailed discussion see Chip Carter’s January 15th 2009 post – Gimme Fuel Gimme Fire: Direct vs. Indirect Heat. I can’t stress the importance of using a timer enough. Think of it as your game clock. As a general rule, meat that is grilled using Direct Heat should be turned only once and this should occur when you reach half your total grilling time. So, for example, on my grill a 1 inch New York Strip done over Medium/High Direct Heat takes about 8 minutes (medium rare) and should be flipped at the 4 minute mark. I don’t know about you guys, but when I’m grilling, there’s usually lots of distractions – having a countdown timer with an alarm keeps me tuned in. Ever seen a football game when the 40 second clock fails? Exactly. Get a good meat thermometer and use it. Bottom line. All sorts of methods are out there for determining doneness and in my opinion none of them come without a cost. Cutting into meat while grilling causes tasty juices to be lost and just plain doesn’t look slick. Trying to compare the feel of the meat to the fleshy part of your hand at the base of your thumb? Come on, really. Does that make any sense? Get a good meat thermometer and use it. Most recipes will tell you what your target internal temperature is and after a few reps you’ll never be without one. Once your culinary masterpiece comes off the grill, cover it with an aluminum foil ‘tent’ and let it rest 3-5 minutes. Resting allows the juices within the meat to redistribute evenly throughout so that they are not lost after the first cut. Do not wrap the meat in foil – in fact its best if the foil does not touch the meat at all. I hope you find Grill Nation’s 5 Keys to Grilling Success helpful. They’re part of my Game Plan every week! And yes, my fantasy team crashed and burned (see Timing Is Everything: Grillers on the Clock) but March Madness and redemption are just around the corner! Every griller knows how important the heat from the burner or the charcoal is to that perfect steak – and to be honest, the beautiful part about grilling is the simplicity. But for those who want to expand their grilling horizons – you’ll be richly rewarded if you understand the different approaches to heat, as described below. 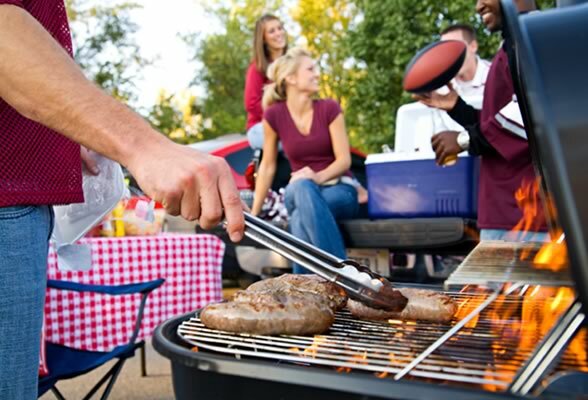 And remember: whether you use charcoal or gas grills, direct or indirect heat – always grill with the lid down! To grill using Direct Heat, place your food on the grill directly over your grill’s source of heat. Turn the food once, when you are halfway through the total grilling time. DO NOT FLIP OUT!! 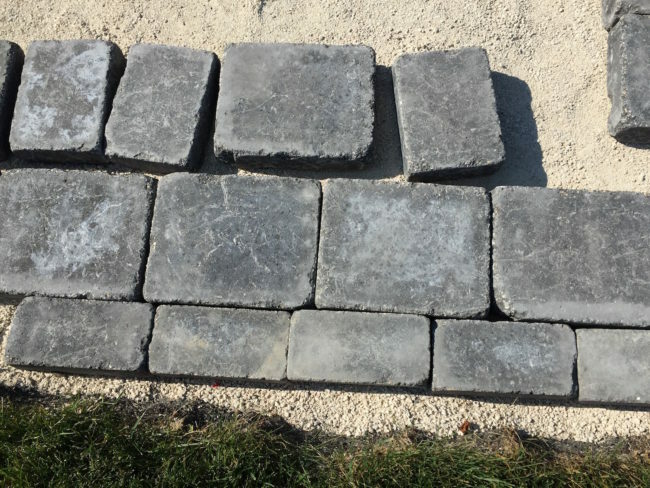 I’m not a fan of multiple turns or flips – this result in unnecessary heat/cool cycles and produces inconsistent results. Not good. 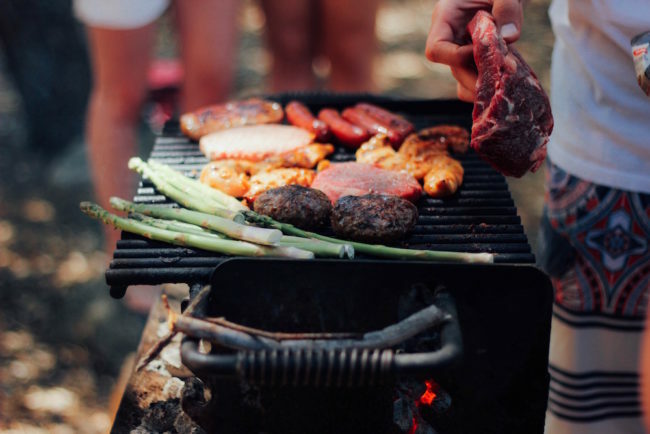 Anyway, Direct Heat is best used for foods with total grill times of 20-25 minutes or less, such as steaks, chicken breast, sausages, brauts and the like – not to mention your grilled veggies. When you think indirect heat, think convection oven, but with way more flavor and way more fun!!! Heat rises from the heat source and bounces off the grill lid and surfaces, slowly and evenly cooking food from all sides. To grill using indirect heat, make sure food is not placed directly over your grill’s heat source. 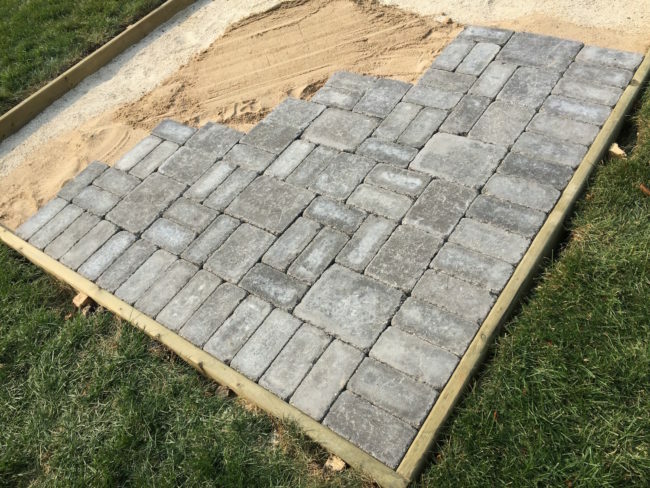 With charcoal this can be accomplished by placing charcoal under both sides of the charcoal grate. 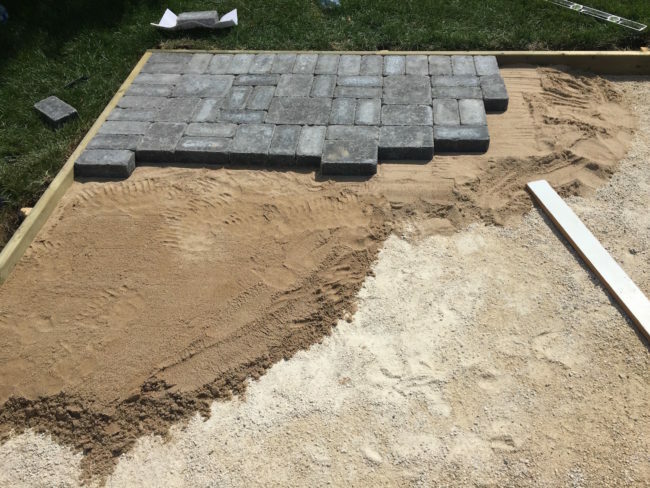 I like to separate the sides by placing a drip pan in the middle. 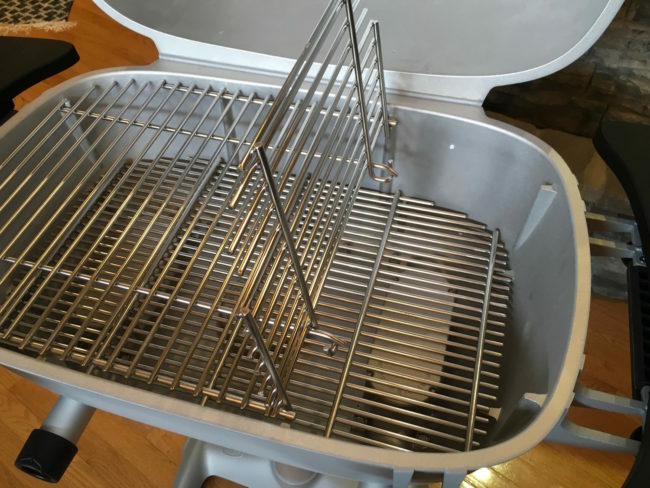 On a gas grill, preheat the grill using all burners and once you’ve reached your target temperature, shut off your middle burner(s) directly under the food. Adjust the burners on each side of the food accordingly. Don’t have multiple burners??? 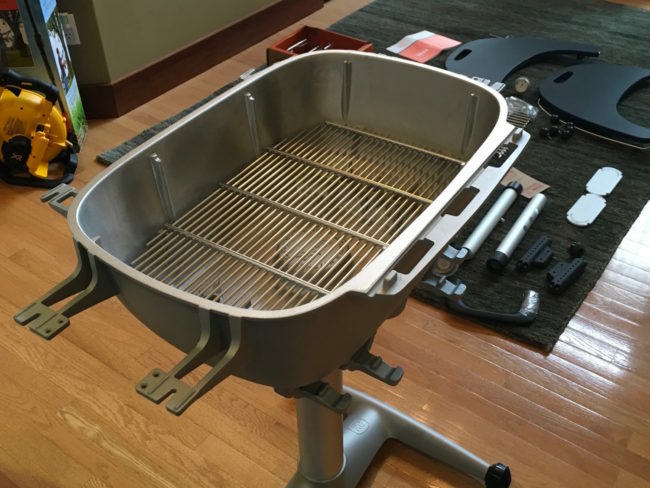 No worries – check out ‘Grill Gear’ section for the necessary upgrades you need my friend! I like to use indirect heat when I’m doing foods with more than 20-25 minutes of grilling time. If you use indirect heat, you’ll soon find that doing whole chickens, turkeys, beef roasts, pork roasts and ribs becomes a tender and juicy snap. DO NOT FLIP YOUR LID! 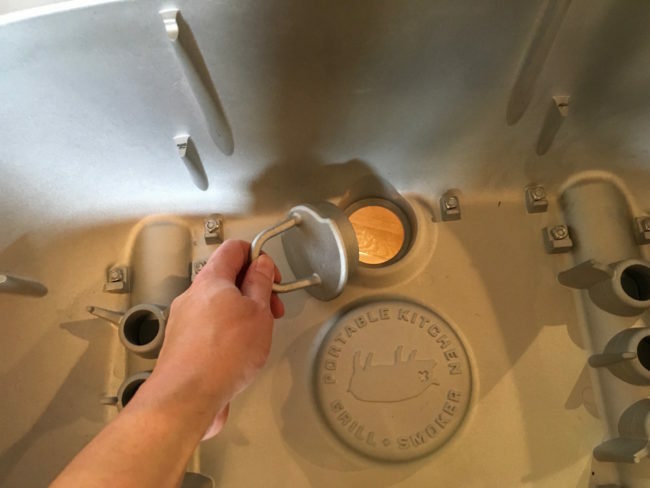 – Ok, this may be a little harsh, feel free to open the lid to baste, and to check for doneness, but otherwise keep that lid closed, valuable heat gets lost and throws off your cooking time every time that lid pops! 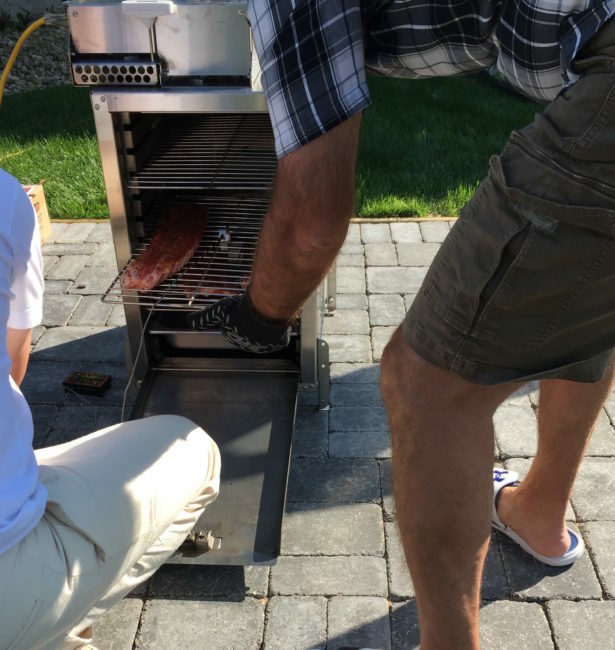 Whatever method you deploy – be sure to tell us your grilling stories, share your secrets if you want, including pictures of your grilling spread on the Grill Nation forums! I believe it was the great Vince Lombardi who once said (and I expect to be corrected by one of my fellow grillers out there if I’m wrong) “…we didn’t lose, we just ran out of time…”. Timing is everything. Including in the great pursuit of that perfect grilling experience. I know, I know, you’re thinking that this Monday morning quarterback just can’t let Sunday go (did you see Denver go for two to win with seconds left against the Chargers instead of kicking the PAT – that’s chutzpah, but I digress…). There’s method to my madness here. 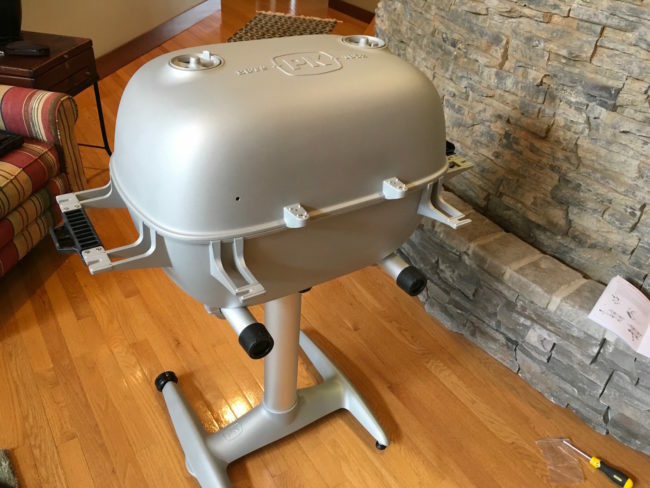 While we wouldn’t think of going onto the gridiron without the clock, we shouldn’t go onto the grill without the clock either. Bottom line – A timer should be an essential weapon in your grilling arsenal, plain and simple. Digital or analog, count up or count down, bells and whistles or vanilla – get one. Unlike the average football play which lasts only seconds, most grill times last considerably longer – so even Peyton Manning’s internal clock won’t get it done here!!! 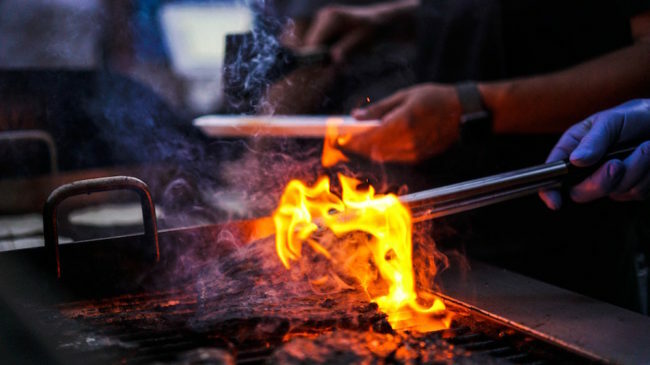 Not only will a timer improve your grilling consistency under ideal conditions, but you’ll adapt better to whatever your grilling menu and mother nature throws at you! 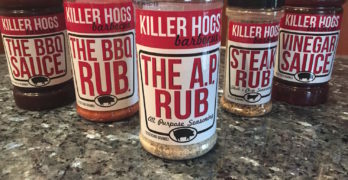 Its an inexpensive, simple grilling innovation that will elevate your game without creating a salary cap nightmare. If only things were this easy for my fantasy football team (can you say Tom Brady…).